Note: As explained in this post, in honor of me and my wife’s first year of marriage, I’m going to spend the second year posting monthly reflections of the same month a year earlier. This is the fifth installment. Thinking about December takes me back seven years, to the weeks before we began “officially” dating. During the strange and wonderful one-week gap that always fell between the end of the university quarter, thus ending the paper-writing and paper-grading season, and the point at which all of our grad student and teaching friends had departed for familial shores, we found ourselves meeting together with other friends through a series of (very!) late nights. I have a very strong memory of one night in particular, of sitting across the table from you in a rather loud and busy place, looking at you as you laughed with your friends, and thinking that I was having the most extraordinary holiday season of my life. That was true — until the next year. And then the year after that. And then the next year… and so on. Because every holiday season together is always just a little better than the last, because we can spend time together and celebrate the things that make our relationship so wonderful. Looking back on last year specifically, our first “married” Christmas, I bring to mind the great joy of simply having some time to share, to take a step back from our frantic schedules and be reminded of just how much strength and grace we can find in those moments together. 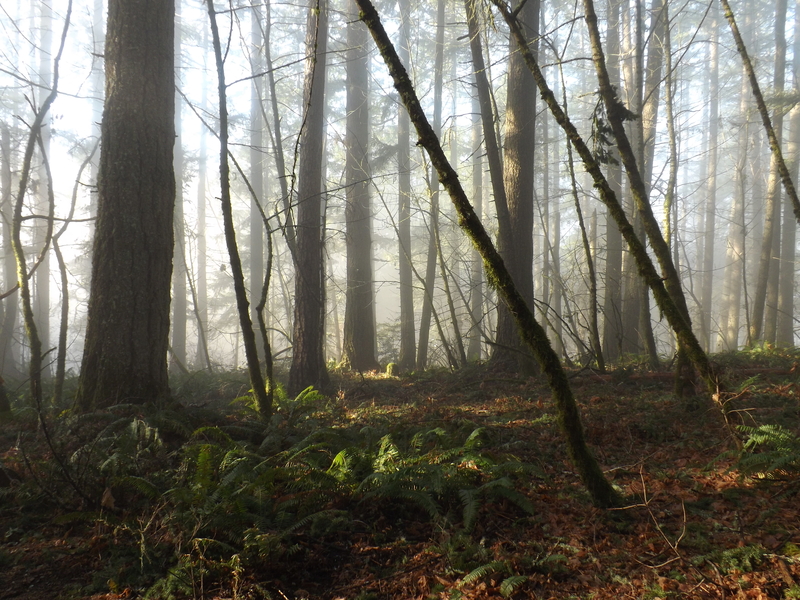 Throughout the holidays, the air hung heavy and low over the southern end of the Willamette Valley, with little or no air movement to clear the thick woodsmoke from holiday fireplaces and the fog that drifted in-and-out of the trees in low pockets around our neighborhood. So we took a morning to drive out, through the fog and the haze, to the butte at the south end of town, to hike up above the gloom. 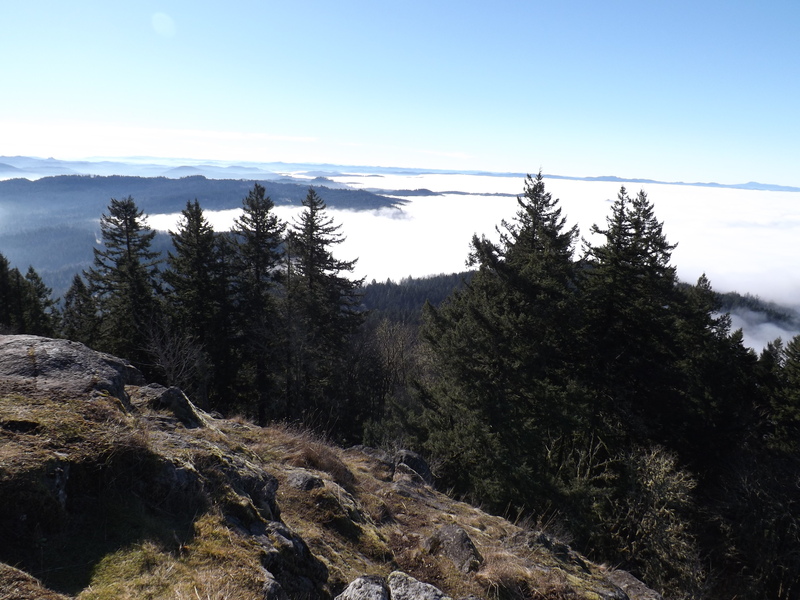 I had hiked the butte in such conditions once before, and knew what we would find — a gloriously sun-drenched peak, surrounded by a carpet of white fog, warm enough to peel off the jacket and hat and relax in just shirt-sleeves. While the holidays had been pleasant so far, the charcoal skies had started to dampen the spirit of the season, and a little sun was just what was called for. 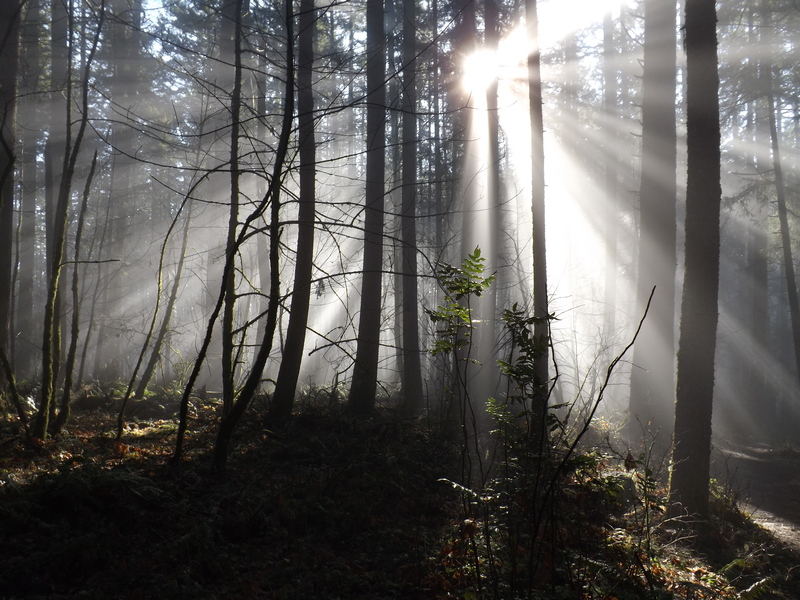 We hiked up through the mist, watching the sunlight slicing in through the trees, until, near the top, we broke through into gloriously clear skies. It was almost like traveling to another world; below the clouds that blanketed the city, temperatures were near freezing; up on the peak, where a wonderful crowd of jubilant hikers mingled together, casually, the temperature was nearly 70 degrees, the sun feeling almost blistering in comparison. We sat on a small ledge and watched the dog (who was possibly even happier than we were to see the sun; “delirious” may be the best word for it) frolic among the rocks, then settle down next to us to drink in the warmth. The place we sat was only a few yards away from the spot we claimed when we had first hiked the butte together, during the holidays five years earlier. To me, that afternoon up above the clouds, in the sunshine, unable to see our house below (a five minute drive from the parking lot of the butte), reminded me that we don’t need to go very far to get a different perspective. The joy of spending the holidays together was tempered, that year, with uncertainty about the year ahead; my teaching position was on a term-by-term basis, and the first round of the academic hiring season was drawing to a close. It would be weeks before I would know what the next round of jobs might look like. You were also looking for a new position, and in any case, it seemed very unlikely that we would be spending the next post-Christmas afternoon back on top of that butte. We were right, of course; and we certainly didn’t know that we would be where we are now. As we descended back through the cloud cover to the shrouded forest, navigating patches of ice and steep angles of descent, I was reminded of how quickly things could change. By the time we reached the house again, it was almost impossible to believe that we had just been up above the clouds, living on sunshine and blue skies. At the risk of sounding like a cheap philosopher here, I look back on that day and take it as proof of several things. First, even when things look grim, there’s sunshine to be found if we’re willing to put in a little effort. Second, life is not lived only in the fog or on top of the peak, but in each and every moment; the climb up the butte was as uniquely beautiful as the view from the peak, and hiking back down a different route revealed new shades of beauty in every step. And third, the most important thing is taking the time to do these things together. This year, I know, is going to be far busier, for both of us; the holidays will not give us time to climb any peaks. But that time will come again, and soon. Thanks for making every holiday season the best yet, HP!